Cooking With Mickey: ADD: Top 5 Disney Snacks for Under $4! ADD: Top 5 Disney Snacks for Under $4! Average Disney Dude: Top 5 Disney Snacks for Under $4! They can come in a bag, or wrapped in some wax paper, they are portable and most can be eaten with one hand. They are snacks! If there is one thing I like to do it's snack around the Disney Parks. Taking a leisurely stroll, people watching and noshing on some delectable Disney treat is part of my joy of visiting the parks. 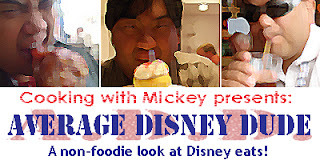 Here's my top 5 snacks for you to consider picking up on your next magical trip to see the "House of Mouse." If you've read my columns at Cooking with Mickey before you know how fond I am of Raglan Road. The love continues to the restaurant next door Cookes of Dublin. One of the more unique offerings is the fried candy bar. 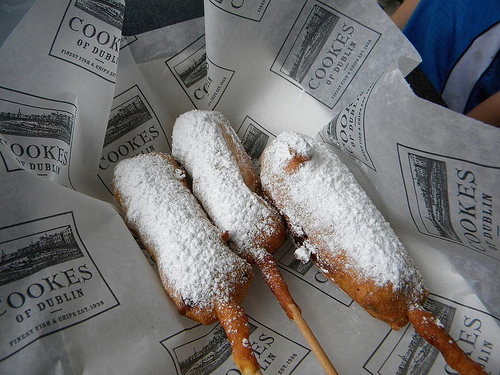 Living in the southern US fried candy bars are pretty common place at state fairs and carnivals, but for the rest of world this is a pretty uncommon. The Doh-bar resembles a corn dog but inside is a sweet chocolate bar with peanuts (possibly a Snickers candy bar - I'll investigate this further on my next WDW visit). At any rate this "heaven on a stick" has a bunch of layers that work toward its addictive nature. The crunchy fried exterior and the mix of sweet chocolate and the savory peanuts and batter make this a Disney "must do." A churro, sometimes referred to as a Spanish doughnut, is a fried-dough pastry-based snack, that originated in Spain. They both are normally eaten for breakfast dipped in hot chocolate or café con leche. After the Portuguese sailed for the Orient and returned from Ming Dynasty China to Portugal, they brought along with them new culinary techniques, including modifying the dough for You tiao also known as Youzagwei in Southern China, for Portugal. However, they modified it by introducing a star design because they did not learn the Chinese skill of "pulling" the dough. 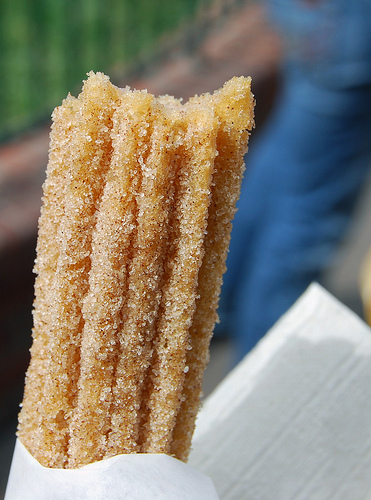 As a result, churros are not "pulled" but rather extruded out through a star-shaped die. Karamell-Küche (which is German for caramel kitchen) has only been around since the fall of 2010 but has quickly gotten the attention of Disney fans looking to satiate their sweet-tooth! As you walk past the store you will immediately take in the sights and smells of an old world German caramel shop. Often times you can see Cast Members making homemade caramel corn, among other items, right in front of you. Just writing about it makes my mouth water! A fun fact about this unique shop is that it is the only freestanding retail location for Werther's in the world, and not only will carry items made fresh daily but a variety of specialty merchandise and gifts that are only available at Epcot. Here's a look at the caramel kitchen's handy work. This is quite arguably the most recognized of all the Disney park snacks, and perhaps the most iconic. Crafted at the Nestle factory near Fresno California, the facility kicks out nearly 170,000 bars per day! 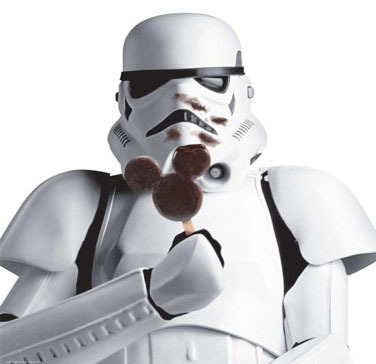 Disney sells approximately 2.8 million bars a year. If you're looking to get your Disney fix and purchase those ears at home good luck finding them. Mickey's Premium Ice Cream bars are only served in Disneyland, Walt Disney World and the Disney Cruise Line! I do hear they are served aboard the Death Star, if you're lucky enough to take a detour there with a Starspeeder. It's hard imagining a Top 5 Disney snack list without the famed Dole Whip Float. 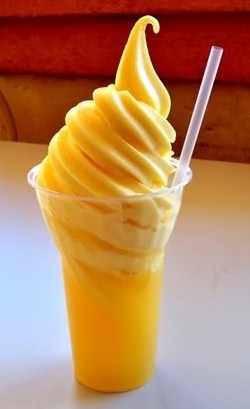 Commonly referred to as a Dole Whip, it is made of soft-serve and Dole fruit juice. The common make up for this concoction is vanilla soft-sever with Dole pineapple juice. You can switch it up and swirl orange or chocolate as well as add orange juice or soda. There are a lot of flavor combinations to choose from. On my last visit I did try doing orange cream with pineapple as well as a Coke float but nothing comes close to the original combo of vanilla and pineapple. Get your taste of the famous Dole Whip at Walt Disney World (at Aloha Isle in the Magic Kingdom, and Captain Cook's at the Polynesian Resort) and Disneyland and at Dole Plantation in Hawaii. It is also available at Jumpin' Jack's Drive-In in Scotia, NY, and also on the Santa Cruz Beach Boardwalk in Northern California. I hope you've enjoyed this month's Top 5 list! As usual please leave some comments about your favorite Disney snacks below. I look forward to meeting you in person at Disney's D23 Expo 2011 as well as the Sorcerer Radio 10th Anniversary Event. I hope to see you all there! Until next time, keep it real! Great list - I have just added #3, #4 and #5 to our must try list for our next trip. We are already big fans of the ice cream bars and dole whip floats! With three kids, we tend to really enjoy the "snacking" around WDW and are always in search of trying something new! Nice article. Didn't know about #5. Will try it! It can't be a 100 Grand bar because they don't have peanuts. Snickers is the most common for deep frying. Stefan, you're probably correct. I'll make the edit in the article to a Snickers bar. Thanks!